In some ways, Ringway 4 is the odd one out of the lot. Well, for a start it's barely referred to throughout the official documentation as "Ringway 4", more often going by "North Orbital Road" and "South Orbital Road", with the join between the two being either at the M4 or the River Thames, dependant on where you look. 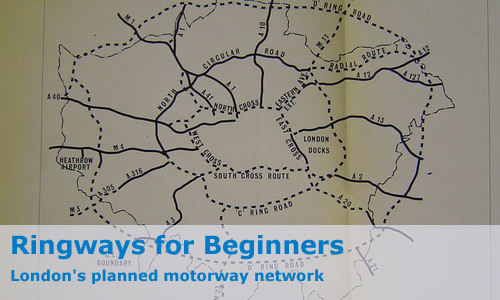 It's also known that only part of it was due to be constructed as a motorway: nevertheless, most of Ringway 4 (or slight variants of it at least!) exists. Go on then, spill 'em! OK, OK. The South Orbital Road exists pretty much in its entirety, save for a route alteration to go the opposite side of Leatherhead: it's the M25 and M26 between the Thames and the M20. Why do you think I mentioned it first? The North Orbital Road is a different kettle of fish. Apart from the section betwen junction 17 and junction 19a, the M25 takes an almost completely different route. Subtly different in some places (changing sides of the village of Iver, for example), it went via M40 junction 1 where it would have had a spur (the Denham Spur) leading to Ringway 3. It's likely that traffic heading around London would have swapped Ringways at that point. Ringway 4's three lane motorway would have come crashing to a halt at Hunton Bridge, at the end of what is now the M25's spur. There's no space left for a flyover, or anything clever at all, just three lanes of traffic slamming into a roundabout. Why? Well, the only theory so far that makes sense is that at this point, Ringway 4 would have ceased to be a motorway, and just reverted to a dual carriageway, probably with ordinary roundabouts along it. Theory? Don't know much, do you? We're doing our best, OK? This section of Ringway 4 is fairly elusive, but one or two things have come to light. It may well have travelled via the A405 and A414 North Orbital Road, although there one or two pieces of evidence that are starting to turn up that suggest that Ringway 4 would have formed a new route somewhat to the east of those roads. It is pretty much certain that the road would have borrowed a short stretch of A1(M) at Hatfield, before turning back east once more somewhere along the line of the A414 before leaving it near the B1455 Holwell Lane, going cross-country and meeting a small constructed section of Ringway 4: the A1170 Dinant Link Road at Hoddesdon. The route would then have gently curved around before joing back up with Ringway 3 (now M25) near the village of Navestock.